Special Offers from Discount School Supply®! : Super Savings on Everything You Need! At Discount School Supply, teachers, caregivers and parents SAVE everyday! Shop today and SAVE big throughout the entire website. Find everything you need in one convenient place. Need more glue? How about crayons? Construction paper? Paint? Head over to Discount School Supply for everyday low prices on supplies like these and MORE! 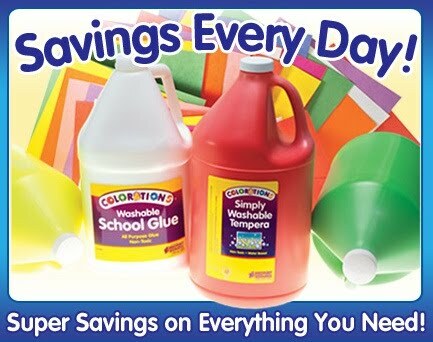 Colorations® Washable School Glue, Gallon for ONLY $6.99 (You Save 41%). Colorations® Washable School Glue adheres to paper, wood, fabric and other porous and semi-porous surfaces. It is completely non-toxic and easily washes off skin, most clothing and other surfaces with soap and water. Common allergen free. 9" x 12" Colorations® Heavyweight Construction Paper for ONLY $0.95 (You Save 40%). Combining bright color and a smooth uniform finish with state of the art technology, our constructon paper offers great performance and appearance at a value price. Ideally suited for arts and crafts, this heavyweight construction paper cuts clean and folds evenly. Recyclable paper is environmentally friendly and the pulping process is chemical free. Colorations® Simply Washable Tempera Paint, Gallon for ONLY $9.99 (You Save 49%). Colorations® Simply Washable Tempera offers the lowest price and best quality on tempera paint - guaranteed! Its smooth, rich consistency, matte finish and opaque coverage make this ultra-washable paint the smart choice for classroom projects. Do-A-Dot™ Primary Markers - Set of 6 for ONLY $14.95 (You Save 12%). A perfect complement to the Fluorescent Do-A-Dots™ and the Brilliant Do-A-Dot™ Markers. The large 2- 1/2 oz. container is easy for young children or children with special needs to hold and control. A creative idea sheet is included with over 20 amazing projects. Dispenses washable, water based, non-toxic ink. Every day is a great day to stock up on classroom essentials. PLUS shipping is FREE on in-stock items over $79! Head over to Discount School Supply now!